It's the 28th of October... that means it's time for the Calendar Girls Monthly Challenge. YAY! Our amazing Miss October (Tami) has challenged us to glitter it up, layer it up, and to shout celebrate Halloween in style. I love it! My solution? I used Stickles GLITTER glue! LOL! I know the Stickles doesn't show up very well, but look closely. It's on the angel wings and also on the purple designer paper. I met the GLITTER requirement! 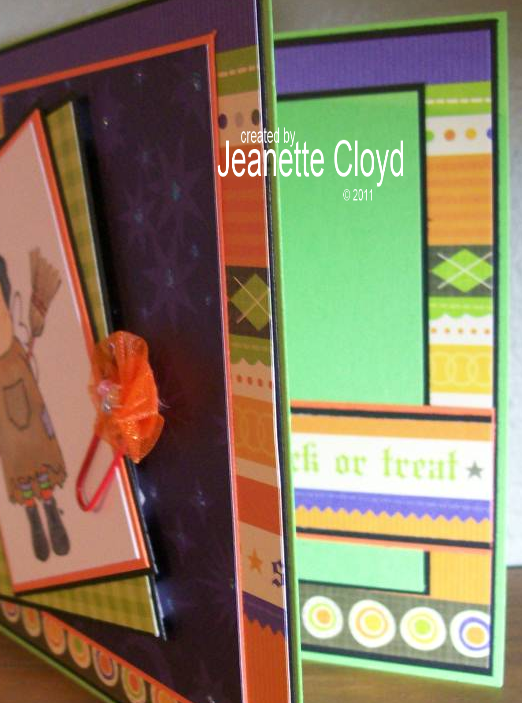 I'm learning from Kelly (Our Miss February) that cards just look better when they are decorated on the inside, too. In addition to the card, Tami asked us to share our favorite candy to receive in our trick-or-treat bags and to share what fun things we do for Halloween. Well, I didn't really get to go trick-or-treating as a child, so I didn't have a favorite candy to receive. But I will say that my favorite candies are things like Jelly Belly Jelly Beans, Fruit Slices, Mike and Ikes, Swedish Fish, those filled Twizzlers... you get the idea. I prefer chewy/fruity candy over chocolate. I know... I'm a bit weird! We don't do much for Halloween. About the only thing is a few simple decorations on the porch and passing out candy to the trick-or-treaters who show up. That's Brock's job. He LOVES answering the door and giving candy to the goblins, witches, and others who ring the doorbell and shout "Trick or Treat!" That is until 7:30, when he promptly turns out the light and heads for the shower. LOL! That's our Brock - a man of routine. 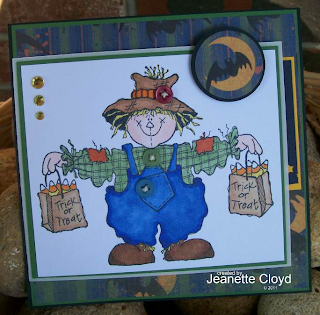 So come on over... ring the bell and shout "Trick or Treat"! We'd love to have you!!! Now, I need to ask you to do something. See the Calendar Girls list in my left-hand side column? 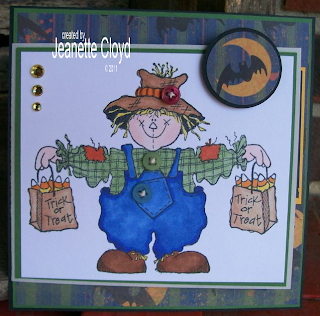 Please go to the blogs of my fellow Calendar Girls and check out their cards and their Halloween traditions. And please leave them a comment! They will appreciate it!!!!!!! I do, too!!! 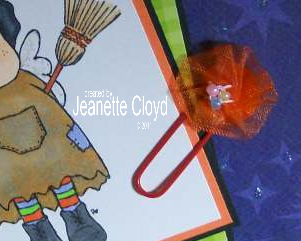 Thanks for stopping by... have a very Happy Halloween!!! 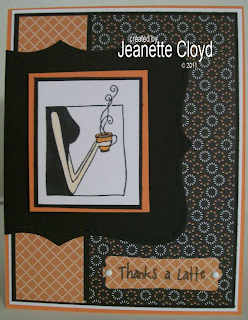 Each month, the Sisterhood of the Traveling Cards Swap has a different hostess who challenges us to get inky and have fun. This month, the hostess is Paola. She had great plans for us. Paola said, AUTUMN is my favorite season of the year, with the gorgeous, changing colours of falling leaves and our mother earth preparing to get ready for the sleepy winter. 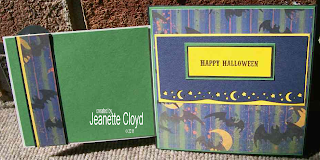 As such, I would like your October's cards to reflect such beautiful, rich fall colours. 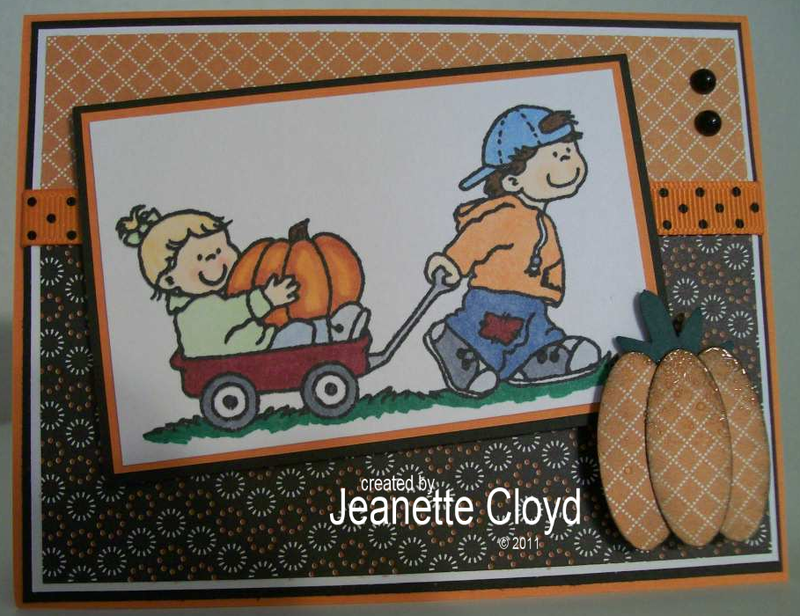 Please have your card's images also depicting one of the following: wine fest, harvest, playing with fallen leaves, fall fruits, pumpkins, raking leaves, scarecrows, Halloween, etc. In short, anything you choose should describe and/or reflect this wonderful month. As a lil' twist, I propose to 'think out of the box' when accessorizing your cards by doing or using something on it that you have never used before. 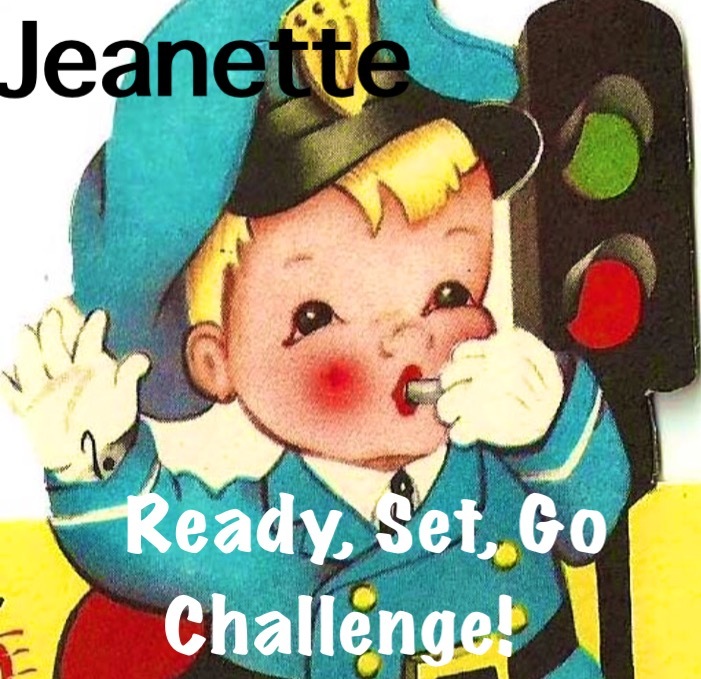 Sweet P, I loved your challenge!!! For my card, I chose a cute little High Hopes image. 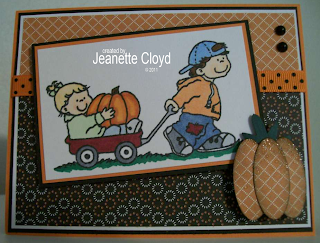 This little guy pulling the wagon filled with the adorable little girl holding her pumpkin cries out AUTUMN! 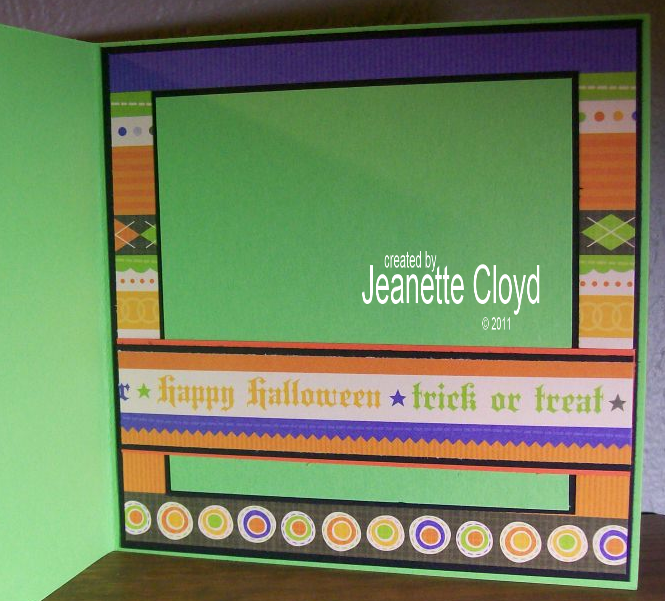 I added just a wee touch of the designer paper on the inside of my card, too. Like Paola, I love autumn! 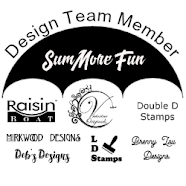 As most of you know, I am Forest Ranger on splitcoaststampers.com. I host forest swaps and the swappers there are referred to as forest friends. 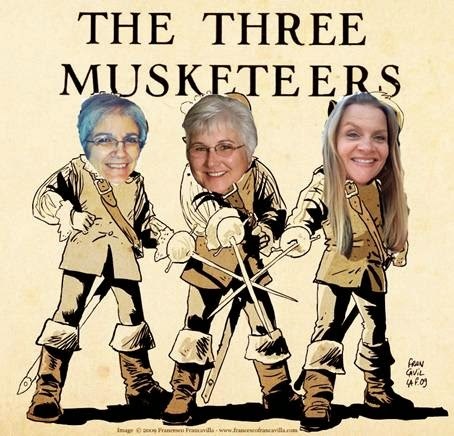 While most of us have never met in real life, we meet regularly in the forest where we share our common love of cardmaking and oh-so-much more. We share our hurts, our joys, our frustrations, our celebrations, in short, we share our lives. It is a beautiful place; my happy place! I also cried a few happy tears. This gorgeous (and sweet smelling) bouquet of flowers was delivered to me just a little bit ago, a birthday gift from my forest friends! Awwwwwwwwwwww.... THANK YOU, my friends! You've made my day!!! I ♥ my Forest Friends!!! It's the 15th, so it's time for the Dueling Darlings to post their montly creations. We are two teams with a hostess for each. 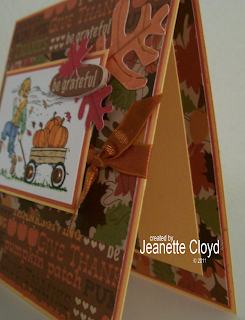 The hostesses (Tami for the Divas and Darlene for the Dazzlers) came up with a wonderful theme - I Love Fall! Darlene sent the Dazzlers a most awesome kit - filled with way too much stuff to use in one card. Papers, papers, and more papers (I'm hoarding several pieces... LOL!) and embellishments galore, too. Thank you, Darlene! 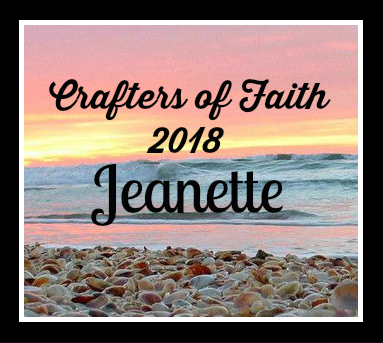 You may not be able to tell from the picture, but one of the things Darlene included in her kit was little wooden ovals and such. I was determined to find a way to use one on my card, since Darlene wrote, "I wonder if you'll come up with a way to use them on your card?" I did! 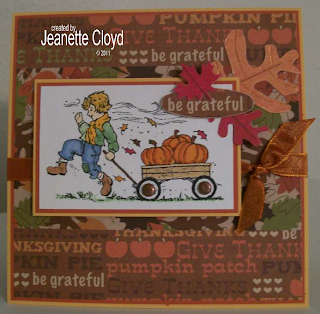 See the be grateful oval on my card front? 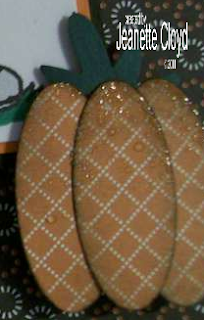 I glued/adhered a piece of designer paper to the oval and then after the glue had dried, I used a nail file to trim off the excess, for an easy embellishment. 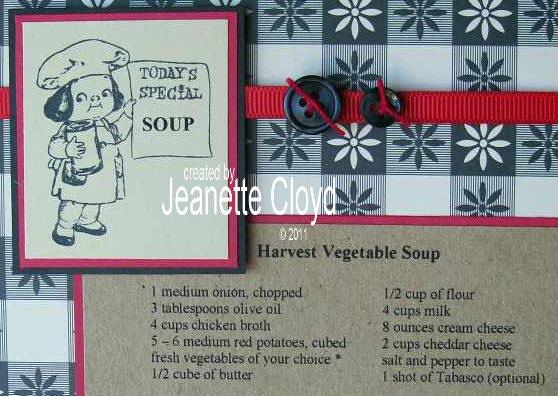 The hostesses this month also asked us to share a favorite fall/autum recipe on our blog posts. 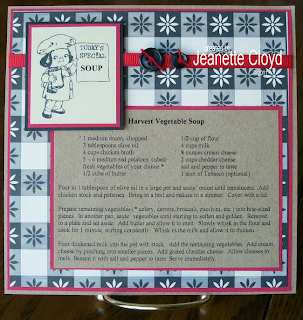 I love making soup and thought I'd share a soup recipe, but then realized that most of my soups I don't really use a recipe, I just dump lots of things in the pot, so decided not to post a soup recipe. Instead I will post a recipe that is full of yummy apples (a favorite fall fruit that our family picks off the trees annually). Mix the Cool Whip and pudding in a bowl; add the apples and Snickers. Stir well. Have I ever mentioned that I'm a lazy cook? I love easy recipes!!! 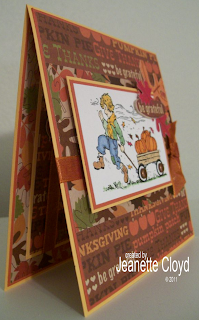 Embellishments: Paper Studio and/or K & Co.
Oops! I made a mistake... a card-making faux pas. I was creating cards that had multiple layers. 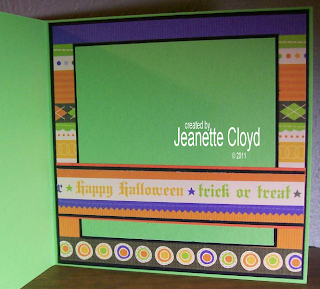 The inside of the card was supposed to have the same sequence of layers as the card front. I did the inside and glued it down. Then I started layering the outside. 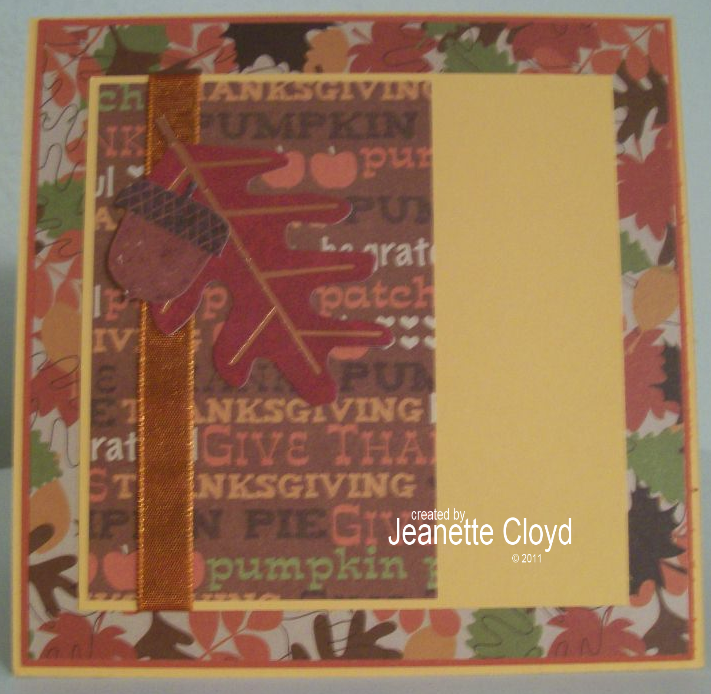 I had them all layered and ready to adhere to the front of the card when I realized I'd reversed the white and black layers. Being a bit OCD (eek!) I had to start over. 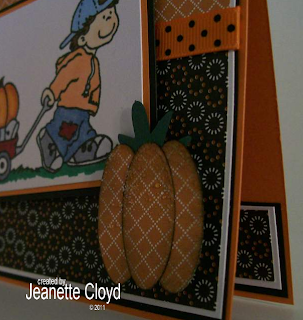 Fortunately, I hadn't added the image yet, since it was going to be popped up off of the card. sooooooooooooooo... what to do with the mistake??? 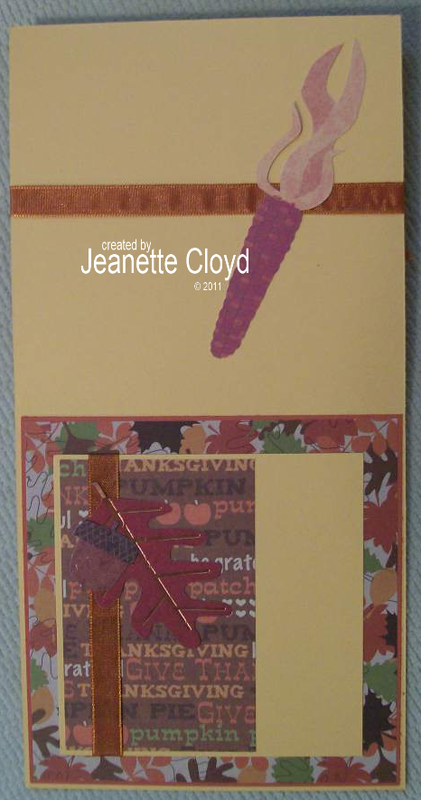 Make a card with those layered pieces, of course. 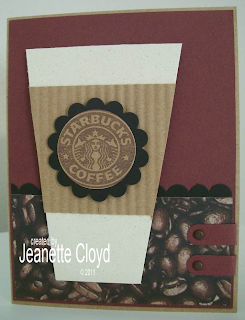 I added the black top note piece (so it wouldn't look too much like the card I'm remaking). Oh, and I turned it vertical while the other card plan is horizontal. I added a different image and sentiment, too. 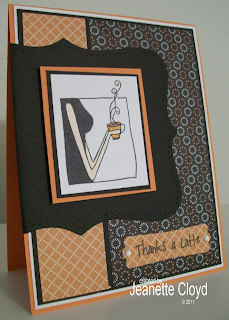 Thanks a latte for looking at my mistake-turned-card! Remember the fun little punch-art dog card you saw on my blog a few days ago? I made it for my daughter's roommate. She had actually requested that I make a card for her with a black dog on it, because she has a black dog. Well, I got to thinking....... it's just not right to send a card to one of my daughter's roommates and not the other. So I was talking to my daughter on the phone and mentioned that, and she said, "Now Anna wants you to send her a card, too." 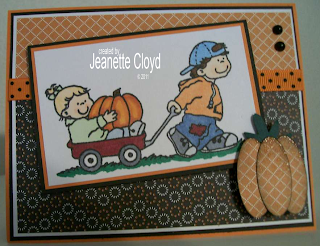 She suggested an autumn card would be good. 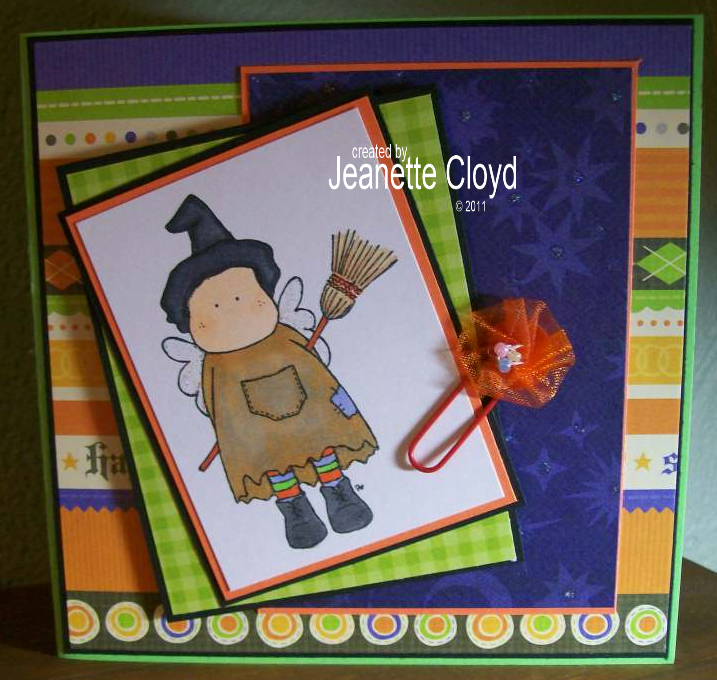 So I searched my stamps and found an adorable scarecrow. GASP! This stamp was still waiting to see ink - and no telling how long ago I purchased it. Soooooo he called out to me. "If I only had some ink!" I'd found the stamp - and promptly stamped an image. 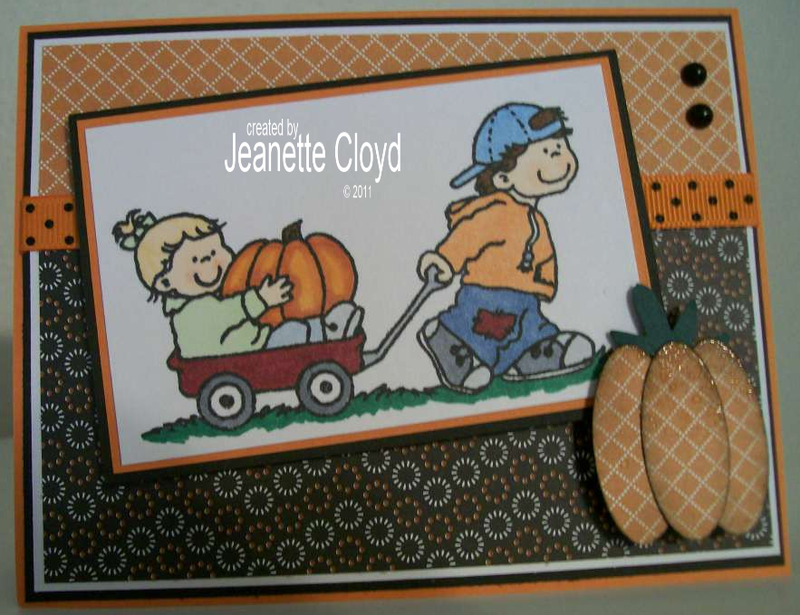 What I discovered is that this particular stamped image is quite large and doesn't leave much room on a card for anything else. So I came up with a rather unique fold - I'm not sure if there really is such a fold, but I made one. 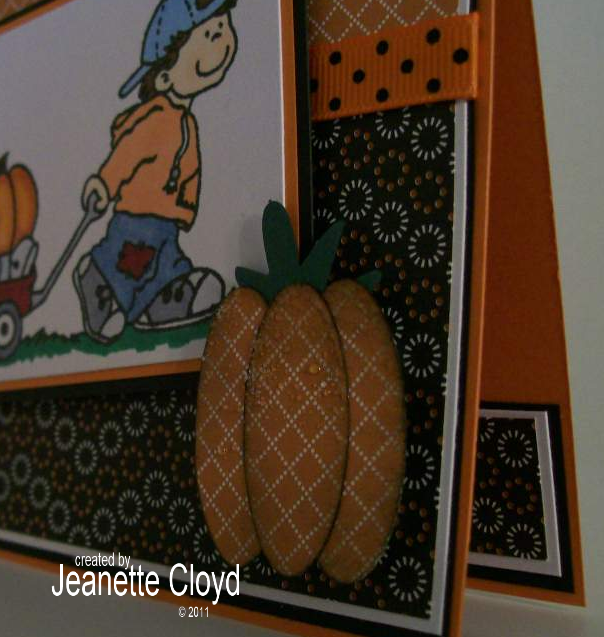 You'll notice in the following photo that the piece the image is on is the only part of the card that opens. I thought it worked out pretty well that way, allowing a little bit of the designer paper to show on the front of theh card, and then getting a better view of it when the image opens up. I hope Anna will like this card! I am so glad that my daughter has friends in her life! 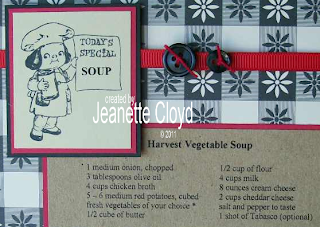 Wonderful, delicious, tasty, YUMMY soup! It is one of my favorite things to cook. Almost every week in the cooler months, at some point my kitchen will boast of a big kettle (or crockpot) of soup, with awesome smells filling the entire house. 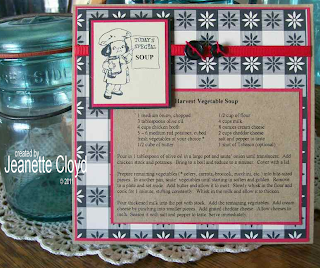 I love the image - it's Crafty Secrets Little Chef. 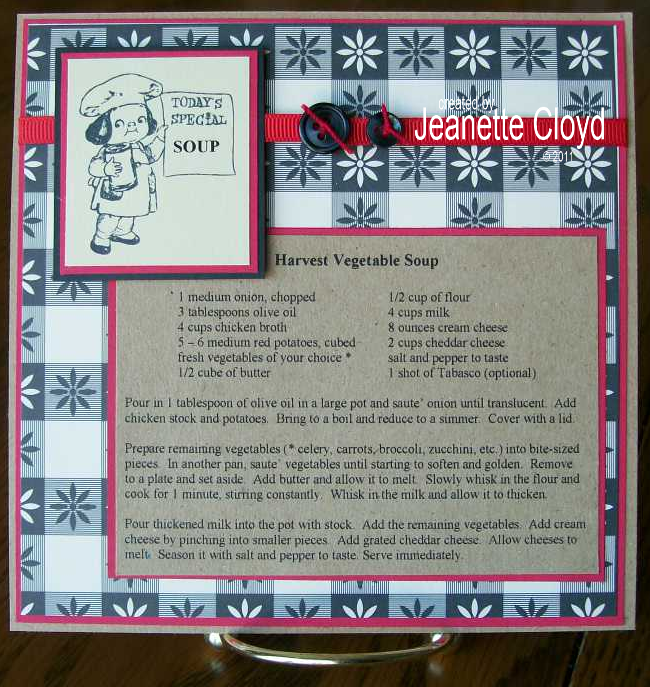 To add the word "SOUP", I first typed SOUP repeatedly in a Word document and printed it out on cardstock. 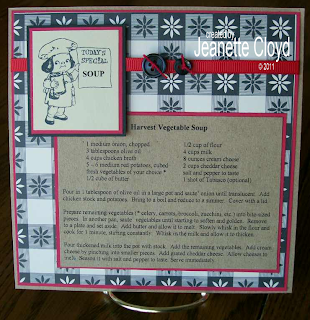 I then inked the stamp (which is clear so it's easy to place it exactly where you want it) and stamped the image with the word SOUP on the placard the little chef is holding. Easy! 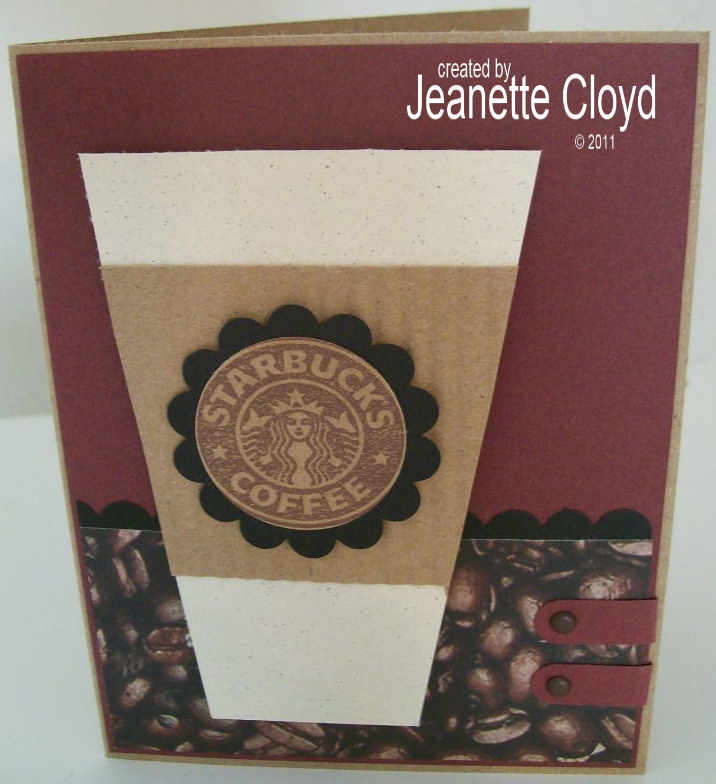 My online friends know how much I love Starbucks! I must talk about it way too much. LOL! 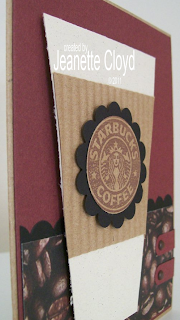 And they knew I was searching for (and coveting) a Starbucks' rubber stamp that I had noticed another stamper using on a card. When Joan found it in her LSS, she bought one...... and GAVE IT TO ME!!! WOW! That is a great friend! Joan, THANK YOU!!! 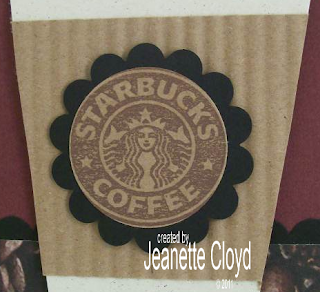 I love my Starbucks stamp!!! Here's a close up of the image... isn't it wonderful??!?!? Joan, have I mentioned how much I appreciate you and your gift of this awesome stamp?!?!? !